This section of the website contains useful information for legal and justice personnel. Below you will find relevant publications, articles, fact sheets, a video, general information and resources for survivors. Blue Knot Foundation’s background paper Trauma and the Law: Applying trauma informed practice to legal and judicial contexts establishes the need to apply trauma-informed practice within and across the legal and judiciary system. Register and download a copy of this paper here. Blue Knot Foundation's fact sheet for Workers in Diverse Service Settings. Blue Knot Foundation's fact sheet for Managers on Trauma-Informed Service Delivery. 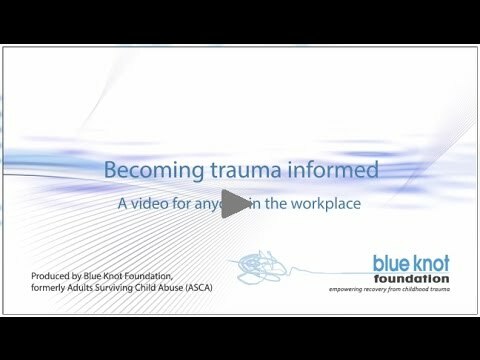 is a video for anyone working in a service setting, including all staff and volunteers, of the possibility of trauma in the people accessing their service. This short video introduces the concept of becoming trauma-informed. Through real life examples, it shows how implementing the 5 principles of Trauma Informed Practice: safety, trustworthiness, choice, collaboration, empowerment can and does make a real difference. Being trauma-informed helps not only the person accessing a service and the person delivering it but also the service culture itself. Being trauma-informed is a win-win for all; this video will show you how. This short video is for anyone in the workplace. It is designed to help staff and volunteers, employed in any capacity and service setting, to be aware of the possibility of trauma in the people accessing their service.